Last week the Center for Disease Control released the latest data it’s compiled on obesity among the U.S. population. 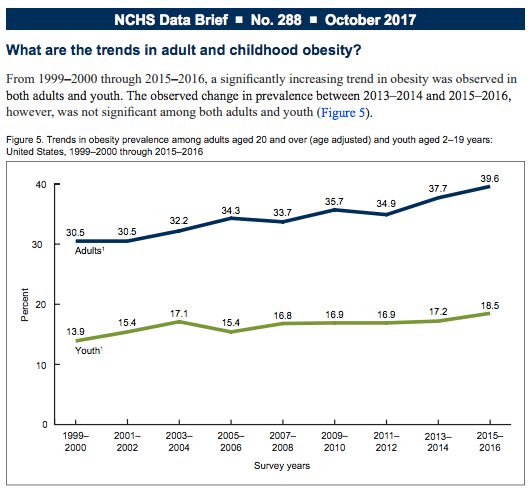 The trends continue upward for both children and adults, though advocates and the food industry had hoped that a plateau of the childhood rate in recent years would begin to turn into a decline. The rates of childhood obesity have more than tripled since the 1970s, according to the CDC. Once again with the Trump Administration it appears that ‘free-market’ capitalist ideology rules, while science and the public lose. White House staff describe recently departed HHS Secretary Tom Price’s prioritization of childhood obesity programs as “inexplicable.” From a WH memo obtained by Crooked Media. CDC efforts to control and reduce chronic disease are referred to as “nutritional nannying” in the Trump White House document. From a WH memo obtained by Crooked Media.